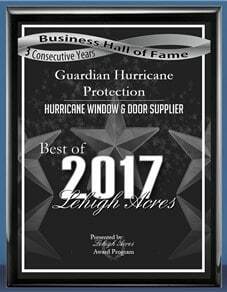 Guardian Hurricane Protection is a recognized leader in the South West Florida hurricane protection industry. Our success is based on a strong combination of customer service, business management and technical competency that comes from years of experience working in our industry. Our goal is to provide our clients a positive experience from beginning to end. We are committed to delivering quality products, exceptional service and value to each and every customer. With the completion of each project our list of thoroughly satisfied homeowners, building managers and business owners continues to grow. 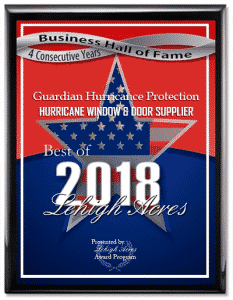 Guardian is owned and operated by Thomas Feibelkorn and Mark Evens, together we have more than 30 years experience in all facets of window and door replacement projects and hurricane protection. We agreed from day one, customer service would always come first. Our work ethic and high standards have guided our company’s growth to this day. We are proud of our diverse and highly competent company representatives. All of our product specialists, efficient office staff and expert installation crews reflect our customer service philosophy. We personally train each crew member to ensure their workmanship meets our highest standards and an owner of the company oversees each and every project. We have well established close relationships with the major window and door vendors, insuring cooperation and support for design and customer service. The result is an abundance of specialized consultants focused on their specific products, enabling Guardian Hurricane Protection to offer in-depth knowledge to our clients. The fact that the majority of our work is repeat business is a testament to this. Guardian Hurricane Protection is a fully licensed and insured State of Florida Certified General Contractor. We are OSHA Certified, have an outstanding safety record and conduct regular on-site safety meetings. Our goal is zero time lost on the job. We are a Nami Certified Manufacturer, PGT Glazing Certified, EuroWall Installation Certified, an ASSA Member and a Solar Energy Contractor. In addition to window & door replacement and hurricane protection, Guardian offers a diverse range of services. Our list of services includes commercial storefront glass, screen enclosures, lanai enclosures, Elite Roof Systems, railing and rescreening and Acrylic Windows to name a few. Guardian Hurricane Protection possesses a unique skill set, including product knowledge, highly trained and experienced installation crews and professional owners who know their business. This unique skill set allows us to flawlessly complete any project regardless of size or complexity. Some of our projects of distinction include, La Peninsula, Dockside, Sandcastle II, BCBE Construction, Tundra Homes, Woodland Homes and Sanctuary Longboat Key to name a few.